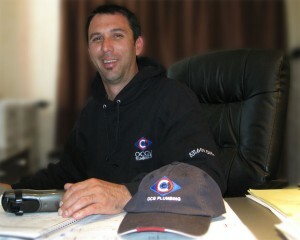 OCG Plumbing Inc. was established in 1990 and started with a simple philosophy: “Be diligent and honest. Take pride in your work and stand behind it”. These basic tenets have allowed OCG Plumbing to grow into one of the most respected plumbing companies in Carmel Valley. OCG is locally owned and operated by long term Carmel Valley resident Oscar “Chip” Grijalva and has been in business for well over 20 years serving the Greater Monterey Bay. OCG is a “Green” plumbing company committed to establishing long-term relationships with their clients and neighbors and to establishing a greener more sustainable community in Carmel Valley. Our professional plumbing technicians are experts at repairing or replacing all types of leaks, toilets, faucets, water heaters, drain and sewer pipes, garbage disposals, fresh water pipes, re-circulating pumps, gas lines, earthquake valves and more . We are dedicated to staying on the cutting edge of the sustainable plumbing profession. So as the industry changes and new and improved green technology emerges such as radiant heat, solar thermal, closed loop gray water systems and rain water harvesting you can be sure we can guide you to the best system for your application and budget. Where other plumbing companies have changed over to “Flat Rate” pricing we are traditional in the sense in that our pricing structure is simply the old tried and true: “Time and Materials”. We feel this more traditional method is far more fair and honest to our customers.